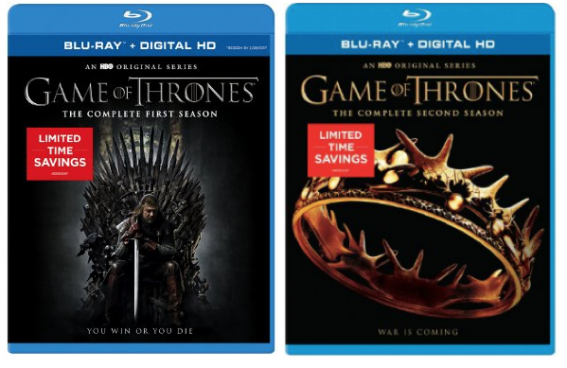 Game of Thrones Season 1 or 2 Only $11.99 On Blu-ray & DVD! You are here: Home / Great Deals / Amazon Deals / Game of Thrones Season 1 or 2 Only $11.99 On Blu-ray & DVD! Didn’t watch Game of Thrones from the start? Now’s your chance to catch up! Order Game of Thrones Season 1 or 2 for Only $11.99 On Blu-ray & DVD! Summers span decades. Winters can last a lifetime. And the struggle for the Iron Throne has begun. It will stretch from the south, where heat breeds plots, lusts and intrigues; to the vast and savage eastern lands; and all the way to the frozen north, where an 800-foot wall of ice protects the kingdom from the dark forces that lie beyond. Kings and queens, knights and renegades, liars, lords, and honest men…all will play the Game of Thrones.